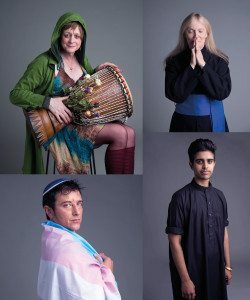 ‘Twilight People’ is a landmark project that discovers and celebrates the hidden history of transgender and gender-variant people of faith in the UK past and present. This collection is the first source of faith and transgender history in Britain. The project explores the narratives around ‘body and ritual’, documenting the interconnection between faith and gender journeys beyond the binary categories of male and female. The images and stories of over 40 members of the various Abrahamic faith communities – Christian, Muslim and Jewish – are documented by means of oral history, film and photography. The collated materials are mapped, catalogued, deposited and shared with the wider audience via free and accessible channels including an archive collection, a Website, interactive digital hubs, a touring exhibition, events including a symposium, a booklet, educational resource packs and other current learning tools including an app. The project title is inspired by a prayer called ‘Twilight People’ written by US Rabbi Reuben Zellman. It is often recited for Transgender Day of Remembrance. It is a reminder that the twilight is not necessarily a place of otherness, but can be a positive, plural space for everyone. The symbolism of the ‘twilight’ , the sacred in-between space – a moment of transformation and rebirth – has been used variously in many religions and faiths around the world. The theme of the Twilight People exhibition will be ‘body and ritual’, covering primarily the time period from the 1980s to today. Physical transformation, religious rituals and religious fetish objects (e.g. hairstyle, accessories, head-gear, jewelry, tattoos) are very often important symbols to mark both faith and gender journeys. Twilight People will capture the voices and images of gender-nonconforming people of faith and interpret them in a heritage context. This project will interpret and share this hidden history so that trans and gender-variant people of faith can be celebrated as members of the wider community. Twilight People is supported by the National Lottery through the Lottery Heritage Fund and hosted by Liberal Judaism. Project partners & associates include: Islington Museum; London Metropolitan Archives; University of Warwick; Gendered Intelligence; various LGBT& faith groups including Safra, Imaan, LGCM, Keshet UK.